Our pest control company tackles the stinging insects that can cause you significant anxiety. There are several pest control companies in the Miami, Florida area that handle all the crawling insects that can besiege your home or business in an efficient and effective manner. 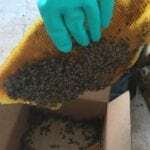 Most of them will tell you that their techniques and pest control barriers are ineffective for flying insects, and that includes stinging ones. If you have a bee or wasp problem at your home, you need a professional that deals specifically with stinging insects — you need us! 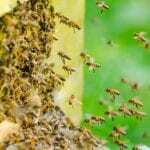 Here at Florida Bee Removal we provide reliable and effective stinging insect pest control that will keep your family safe and protect your home from the damage that some species and situations can cause. Another thing that most standard pest control companies won’t provide is around-the-clock response. Since stinging insects that swarm can be a serious threat to your family, we provide our services any time of the day or night. Whether during business hours or beyond, your services will be conducted by an extensively trained professional that constantly attends workshops and seminars to stay up to date with industry innovations and developments. We regularly perform research on new products and methods so that we can be confident we are always giving you the best pest control services possible. If you are dealing with bees (bumble bee, honey bee or carpenter bee), wasps, hornets, yellow jackets, cicada killer wasps, or any other stinging insects, don’t hesitate to contact us to schedule a free assessment and onsite inspection. With nearly 60 years to our credit, you can be confident your issue will be resolved effectively and professionally.